It is often said that location is the most important part of carp fishing and I’m not going to argue but there is another factor that I consider to be equally as important. That is timing, which isn’t pushed anywhere near as much. I’ve never seen anyone write ‘timing, timing, timing’ – yet it goes hand in hand with location. 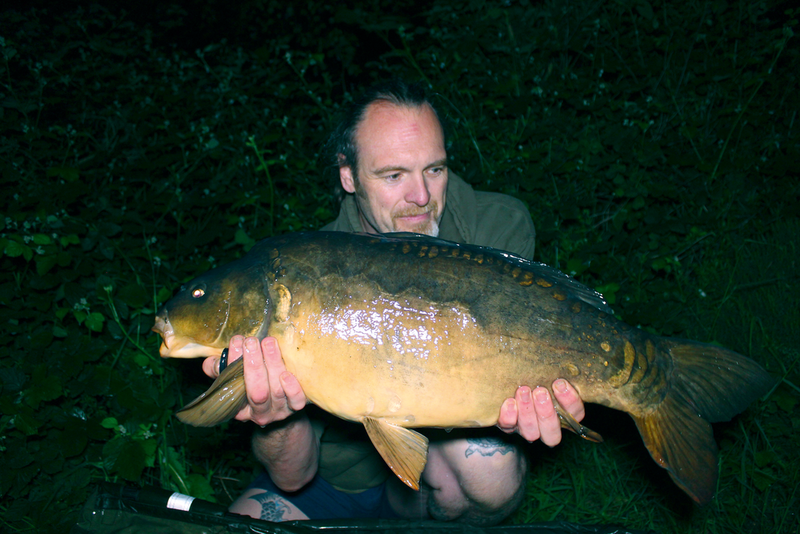 On smaller waters it is usually a 24-hour thing, like on the small syndicate water I fished a couple of years ago. It was about six acres, with an island at one end which the carp were regularly around, but sometime from late morning to mid afternoon a number of carp would appear in one of the far corners which is where I’d usually end up fishing due to the lake being busy. Once the chance of a morning take was gone I’d quickly re-cast the rods to make sure everything was perfect then wait. Once I’d figured out that pattern of behaviour, I caught a few nice fish from there! On bigger pits, like the one I’m sat beside while typing this, the timing of the carp’s location is extended from a daily routine to an annual or seasonal one. I’ve recently had a spell of success on a big pit I’ve fished on and off since 2000, and it was knowledge from previous captures which led me to these. The carp in this pit are hugely nomadic, due to the almost complete lack of weed. A few years ago, the sailing club were having problems with massive amounts of weed which they just couldn’t sail through – a problem they solved by spending a lot of money on blue dye to stop the weed in its tracks. It worked and whereas before the weed could hold the carp in an area for a while, now they seem to be constantly on the move. There are still a few shallower areas that see silkweed and eelgrass growing, but not as quickly as it once did. These areas are also where the carp like to congregate prior to spawning, so a good catch of fish is possible. My fishing has suffered so far this year due to other interests taking up my time, but the fishing bug is never far away. I had the opportunity of a night on the bank recently which, to be honest, I wasn’t too bothered about, until I looked at the weather forecast. The wind was a warm north-easterly which blows onto my favourite area of the big pit and, although it is at range, some shallower water which still weeds up can be reached. In the past the carp have spawned not too far from there, so I just had to get myself on the bank. The wind was blowing exactly as forecast so I headed straight for the area of the pit I fancied. Although the swim I wanted was empty someone was fishing the smaller swim only a few yards away which was a bit too close for comfort. About 50 yards along the bank was a second swim I’d caught from before, under similar conditions, so I settled in there instead. It certainly was not the most comfortable of swims with the bivvy being set up on a ledge that has been roughly hewn from the bank, and the rods in the water at the bottom of three steep, uneven steps. Casting wasn’t easy either. With the feature I planned to fish being a good distance out, I needed room to cast, which meant I had to wade perilously close to the edge of the marginal drop-off. I also gave the tree at the side of the swim a little haircut so I could watch the water a little better from my precarious position. Not too much though, only enough to afford me a decent view from eye level, while sat on the bedchair. This all sounds a bit awkward, but give me that over some huge, tailor-made, soulless, manicured and wood-chipped swim any day. A couple of casts with a bare lead found me exactly what I was looking for. A short drop of the lead, with a hard ‘donk’ onto the top of the feature. A plateau, which is part of a bar that runs almost parallel to the bank. It is a feature I’d love to see up close because it is far from a uniform bar. There are ups and downs all along its length – in fact, I suspect many of what we think are fairly uniform features, are actually anything but upon closer inspection. The rods were all clipped up to the same distance and carried identical rigs. These consisted of a short, lead-free leader, lead clip, 4oz lead and a slightly altered multi rig. I’ve started using a hook with an in-turned eye and a short piece of shrink tubing to create a bent hook effect. As with any rig I use shrink tubing on, I cut the end of the tubing at a 45 degree angle. 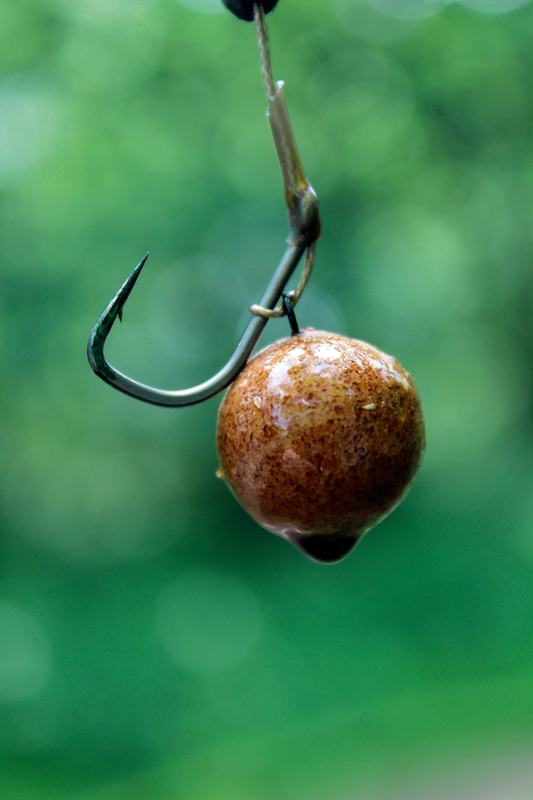 This aids the flipping of the hook in the carp’s mouth and gives great hook holds. I lose very few fish to hook pulls when doing this. I had a lengthy chat about bait with John Llewelyn earlier this year and he put me onto his Fruit Bomb Salmon, which he describes as his go-to bait. That was more than good enough for me, particularly when someone as experienced and knowledgeable as John says so. It’s a complex mix of ingredients and flavours that complement each other well, so although this was the first time I’d used it there (possibly the first time anyone had), I was confident that if I’d got the location and timing right, I’d be in with a shout of a fish or two. I watched the water hard, yet only saw the one carp show, it was so far away I may as well have not seen it! Dark descended and with it came the first action. My heavy bobbin slowly dropped down and the culprit was a big bream, almost certainly into double figures. It was not what I was there for so I simply unhooked it at my feet and let it go for the chaps who want to catch them, to enjoy. I quickly re-baited then recast, the rod was soon fishing again and I was off to the land of nod. That didn’t last too long though, as the next take wasn’t a slow drop back, it was a screaming take, with an unseen adversary that was doing its best to empty my reel of line! I wasn’t having any of that – it’s my line and I wanted it back. So I went into battle with my first big pit carp of the year. 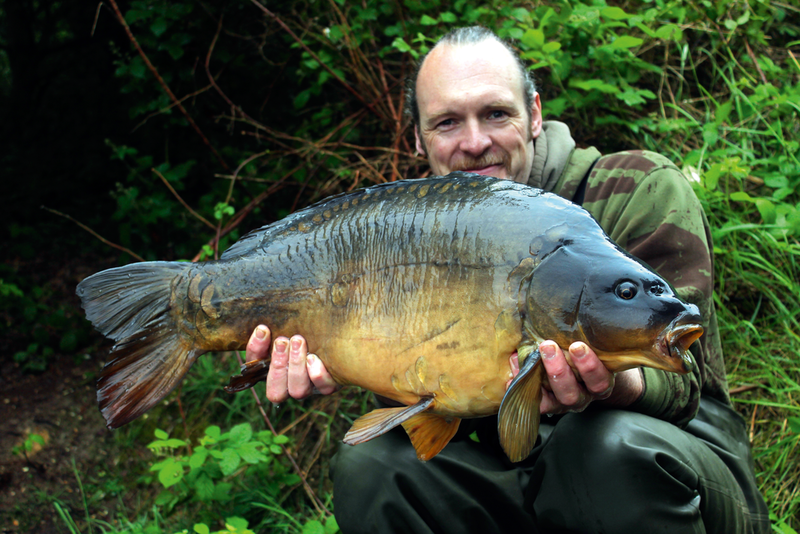 Almost without exception, these carp are in immaculate condition and fight like their very life depends on it. This one fought hard at distance, then continued to do so in the deep margins until, eventually, it succumbed to being netted. It was good to be back! I got the self-take camera kit, mat and sling sorted ready for our five minutes alone and recorded a weight just shy of 30lb. Not a bad start I thought as I got the rod back out and climbed back into the kip bag. I’d barely shut my eyes when the same rod signalled another drop back and I groaned as I thought a bream would be the culprit. I was in no hurry to get back into the water, so I took the time to climb into my chest waders rather than just slip on the crocs and jump in. I picked up the rod and must have wound in about 50 yards of line before feeling any resistance, which was way down to my right and caused me to instantly loosen the clutch on the reel. This was no bream and another angry big pit bruiser set about charging around in the deep water in front of me. In due course it managed to wipe out my other two rods before being netted, which I really didn’t need, but it’s a risk we all take when fishing with multiple rod setups. 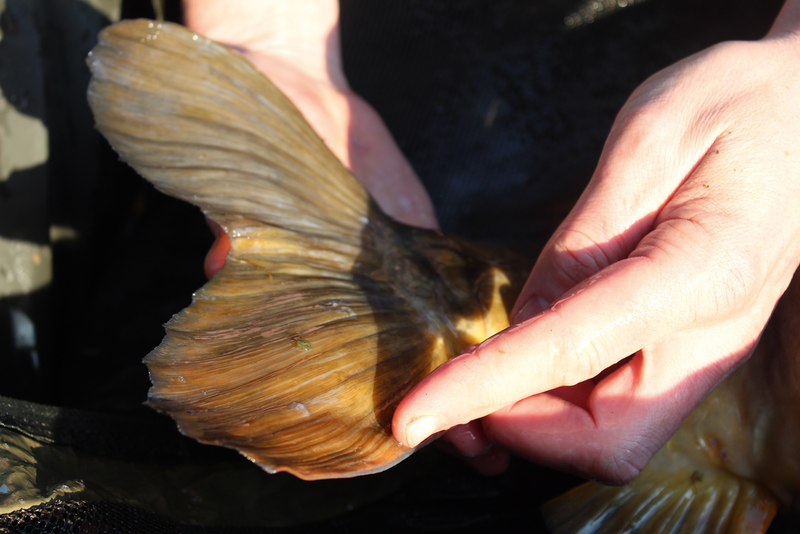 Unlike the first fish which was a solid, muscular, male carp, this was a plump female which was looking ready to spawn. The weight recorded was 27lb. Light was just starting to break so all three rods were re-baited and dispatched back out into the dawn. I was happy with the two fish and was having thoughts of a few hours sleep, packing up and then heading back to the real world. The carp had other ideas however and soon I was back in the water, playing another angry carp. One thing you don’t want when you are stood in a lake in your pants, playing a fish with one hand and relieving yourself with the other, is a voice behind you! It was the bailiff, popping round before he went to work, who thankfully missed the opportunity to take some embarrassing photos of my situation, but did some cracking pictures of the fish – which was another chunky female, again weighing 27lb. I did manage a couple of hours much needed sleep after that fish, but a fourth carp woke me up with another screaming take, although this one didn’t feel as big. It was a humpbacked 19-pounder which drew the session’s action to a close. I was more than happy with my results especially as it was my first time out for a while. The next week at work seemed to take forever as I really wanted to get back on there, because I knew that as soon as the fish spawned the game would change. I had a two-night session planned which was cut down to only one night due to having to take care of some other business. The wind had spun back around to a north-easterly which was perfect. I drove around the lake to a swim I know well and this time it was free with not another angler in sight. Again the fishing was at distance but well within the range of my 13ft 3½lb Aircurves. I had room to fish four rods in this swim so I had two spots, each with two baited rigs on them, with a couple of kilos of bait over each. The only change I made from the previous week was to have all the rods baited with matching pop-ups – whereas the week before, I’d had one on a white pop-up, albeit still the same flavour. Of the four fish I’d caught, only one was on the white and it was the smallest. I’m far from an expert but there are ways of increasing your average size of carp by using ‘big fish’ baits. The Fruit Bomb Salmon is such a bait and I was matching the hatch on all rods now. I woke up about 2am to answer a call of nature and saw motionless bobbins which concerned me slightly. I was expecting action but not even a bream had disturbed me, so I made a brew and sat up for a while to listen for any disturbances out in the abyss. I’d neither heard or seen anything when, out of the blue, I was away with another big pit carp. This fish felt like a good one and was reluctant to come in from range. It seemed to take a long time to turn at the end of each surge, which is often the sign of being attached to something special and after a few heart stopping moments in the margins when it decided a tree was a better place to be than my net, it was mine. I could see I had a nice long mirror in the net so secured it in the retaining sling while I got the self-take kit ready. A fog had descended so I left the rod propped up against the bivvy. With three rods still fishing, I wasn’t too bothered about getting it back out. Doing the photos was a bit of a struggle with the fog and darkness but I wouldn’t have done it any other way. I could have left the fish in the retainer for a couple of hours but that is just wrong. There is no need to do so, in my opinion. Ever! We have a duty of care for the fish we catch, and their welfare must come before our vanity every time. Self-takes weren’t needed for the next carp which was around the low 20lb mark, just as Martin the bailiff was doing his early morning rounds. He’s one of the few people I trust to take a good photo. That was the end of the action for that session and I was soon back home. I could go on with more tales of some of my big pit captures that followed, but I fear I’ll start to bore you. Instead I’ll leave it there, hopefully having given you some food for thought. At the start of this article I mentioned the importance of timing. It is something that can only be learned over time and by either taking notes or having an amazing memory. In carp fishing, history has a habit of repeating itself. Whether it is through your own memory, or doing your research, keeping details of past captures and the conditions they were caught in, it can pay dividends. As a quick example of history repeating itself, almost three years to the day I fished a two-night session on the big pit and did the first night on the end of a north-easterly wind. When I woke up it was so cold I’d probably have had more chance of catching an arctic char than a carp. I moved to a more inviting swim on the back of the wind, that I could imagine the carp finding as comfortable as I did. 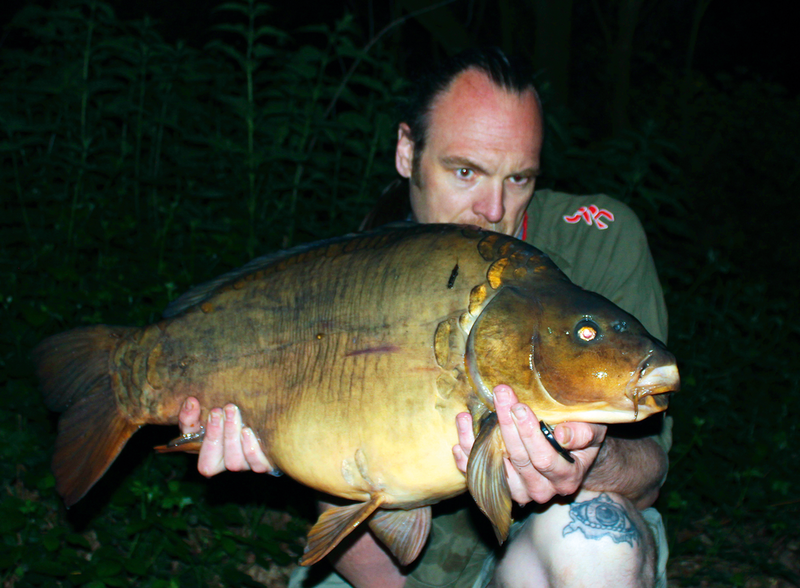 That night I had a fish of 32lb-plus which justified my move. Fast forward three years, and I’d fished a night right on the end of another north-easterly wind although I have to say, this one was nice and warm. The night was fishless so the gear was crammed in the back of the car to go searching. On my rounds I stood in the swim I’d caught the ‘30’ from three years previously and recalled the capture in my mind. Although not as cold, the conditions were similar and the NE wind was now getting a bit stale. I just had to fish the night in there.